John F. Abel, David P. Billington, Kai-Uwe Bletzinger, Annette Bögle, John Chilton, Charis J. Gantes, Phillip L. Gould, Reinhard Harte, Kazuo Ishii, Shiro Kato, Mamoru Kawaguchi, Ken’ichi Kawaguchi, Wilfried B. Krätzig, René Motro, Ihsan Mungan, Tatsuo Murota, Ekkehard Ramm, J. Michael Rotter, Masao Saitoh, Jörg Schlaich, Mike Schlaich, Hans Schober, Edward M. Segal, Ronald E. Shaeffer, Brian Smith, Narendra K. Srivastava, Ulrik Stottrup-Andersen, Ludevit Végh, Petr Végh. 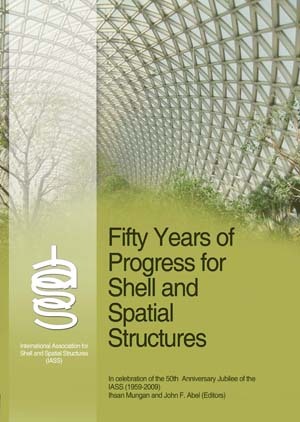 The book, Fifty Years of Progress for Shell and Spatial Structures, was inspired by the 50th Anniversary Jubilee of the International Association for Shell and Spatial Structures in 2009, and the publication in 2011 was timed to coincide with the 50th anniversary of the death of the illustrious founding President of the Association, Eduardo Torroja y Miret (1899-1961). The book was co-edited by I. Mungan (Turkey) and J.F. Abel (USA). The objective of this IASS 50th Anniversary Jubilee Book is to document the developments in the fields of shell and spatial structures during the five+ decades since the Association was founded. In this way, contributions to the fields of shell and spatial structures through the efforts of structural engineers, architects, builders and academics – in many cases, brought together in the IASS – are scanned to give inspiration for further progress and to help show the way to the future. Twenty-nine distinguished authors have provided contributions totaling 500 pages with 734 illustrations and photos, 590 of them in color. The book also contains illustrated biographic sketches of 89 pioneers and actors who have been or are currently involved in the various fields of shell and spatial structures. The first third of the book opens with the context of the founding of the Association in the 1950s and then presents a decade-by-decade account of developments as viewed through the lens of the IASS. The remaining two-thirds is an alternative view of the post-WW II era in the field by examining progress by various structural types and topics.